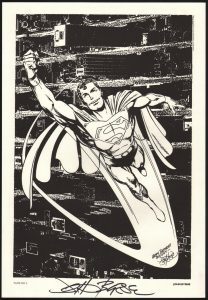 Released as part of a collection of prints honoring the 400th issue (and 45th year of continuous publication) of the Superman Comic Book series originally launched in 1939, this print is dated 1984. The print measures 10 by 14 ½ inches, is in excellent condition and will be shipped with the utmost care. Best of all, it is actually signed by hand by the artist- John Byrne (who would go on to relaunch Superman for DC just a few years after this print was released). This image is Byrne’s first published Superman artwork. Please note- the signature is real. It is the actual, hand-signed signature of Byrne. It is not a pre-printed image or facsimile signature.